This summer I’ve decided I want to learn to paint with acrylics. So, as I’ve done before here and here, I’m committing to painting a small acrylic painting every day for the next 100 days. At the end of that time I hope to be more comfortable painting in acrylic and to have a bunch of work to show for my efforts. Unlike my previous projects, I don’t entirely know what I’ll be concentrating on as far as subject matter goes. Right now I figure I’ll paint whatever subject appeals to me in the moment, concentrating on technique and composition rather than say, landscapes or portraits. Today’s painting is based on a video tutorial that I watched this morning. The tutorial was about making a dark to light background and featured a bird and some branches in silhouette. It used just two colors—black and white—to make it easier for a novice (that would be me!) to get the hang of blending and simple enough that I would have a nice painting at the end. I was inspired by the idea of a bird and also the graduated background. But of course I had to mix it up a little bit. Two colors? Nah. How about four? See, I love to get up before the sun and watch it coloring the sky orange and gold and shining through the trees, so I decided to make my background reflect the color of the sky from this morning. So I needed red and yellow for that. For the bird I picked a red winged blackbird because they have so much personality and they’re everywhere around here. Plus, they have lovely red and yellow epaulettes on their shoulders, so I thought that would be perfect with my peachy background. 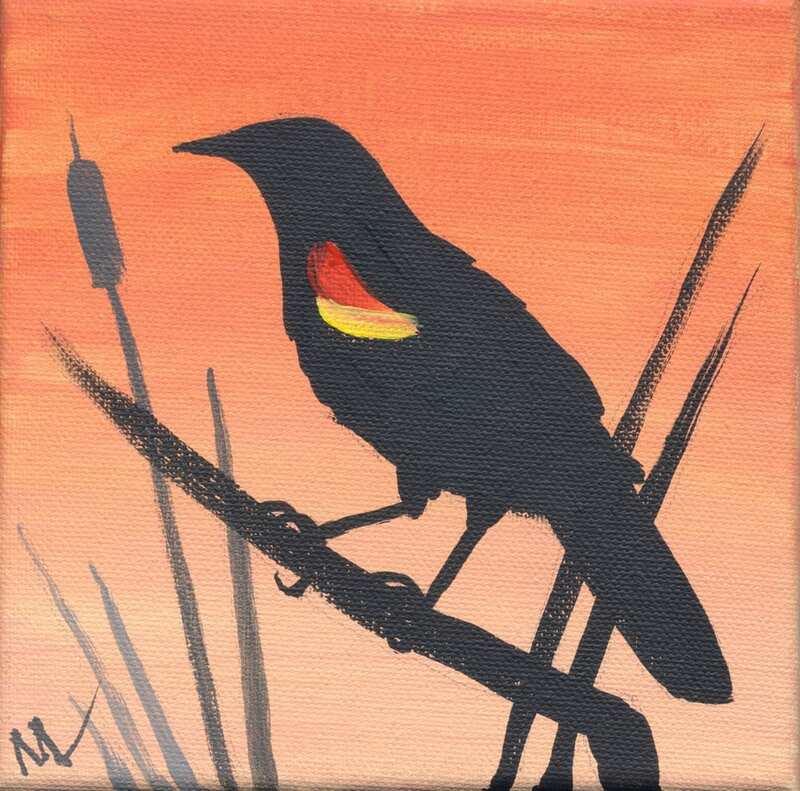 001 Red Winged Blackbird, 6×6″ acrylic on canvas. ©2018 Marie Marfia. Fear not, I am not giving up on pastels! I will continue to work with them because I love doing it. But it’s always good to shake things up if you possibly can, try something new. Keeps me thinking creatively, and who doesn’t need more of that? I’ll be posting them here on my blog, so if you’d like to keep track of my progress, please bookmark this page and come back often. Or come and visit me in Ludington, Michigan. I have a new exhibit space next to the Bonafide Gallery called James St. Gallery and I’ll be hanging these paintings there all summer. Hope to see you soon! This entry was posted in 100 Acrylic Paintings, bird, painting a day and tagged orange, painting a day, peach, red, red winged blackbird, small painting, yellow on May 21, 2018 by Marie Marfia. Today’s small landscape started with a warm underpainting in red, orange and yellow. It really makes for a lively finish! So different in feeling from yesterday’s painting. Just Peachy, 5×7″ pastel on gator board with pumice ground by Marie Marfia. Part of the Julington Durbin Preserve series. $75, unframed. Contact me to purchase this painting. This entry was posted in A pastel a day, Emotional Landscapes, Landscape, painting a day, Pastels, Woods scape and tagged daily painting, painting, pastel, path, small art, small painting, trail, woods on May 18, 2016 by Marie Marfia. I was watching a Karen Margulis video this morning for inspiration and, huzzah! it worked! 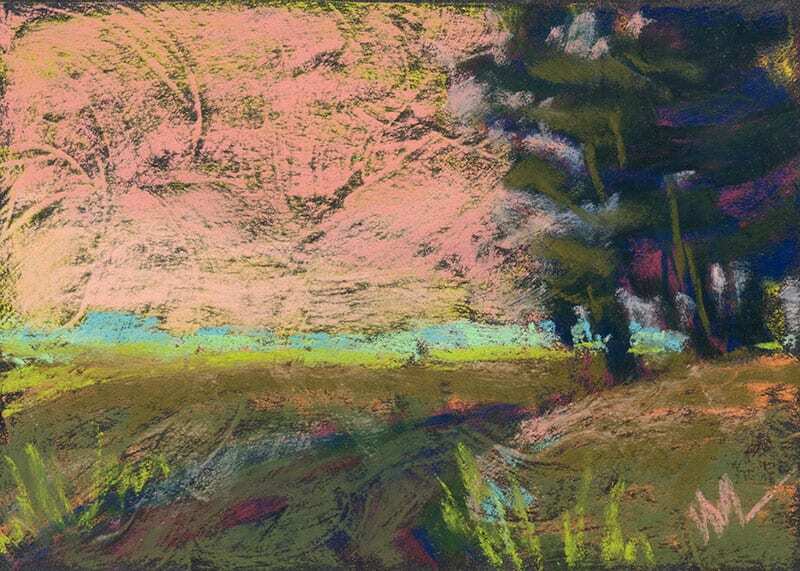 I picked out a photo of the Julington Durbin Preserve and did a quick pastel study. So very satisfying. It’s a great way to begin the day. Short, sweet and not nit-picky at all. 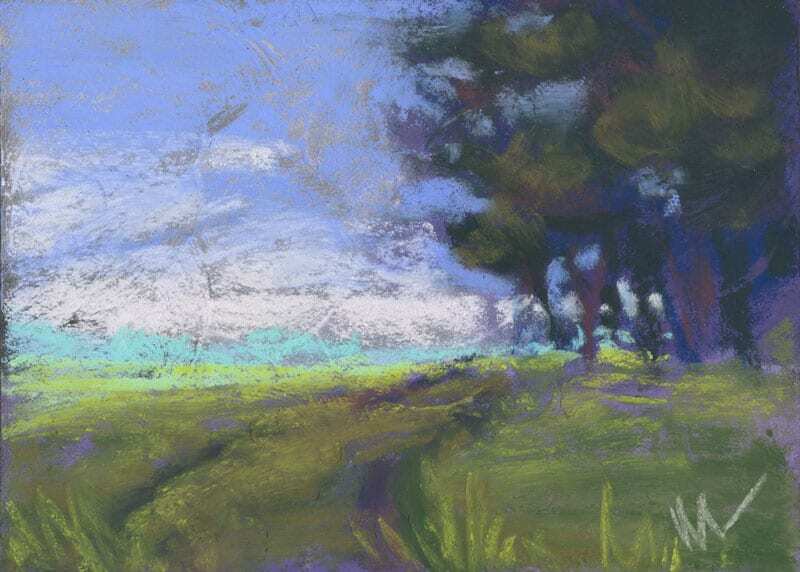 Around the Bend, 5×7″ pastel on gator board with pumice ground by Marie Marfia. Part of the Julington Durbin Preserve series. $75, unframed. Contact me to purchase. This entry was posted in A pastel a day, Emotional Landscapes, Landscape, Woods scape and tagged landscape, pastel, path, small art, small painting, Study, woods on May 17, 2016 by Marie Marfia.